Salmon-Safe BC is pleased to announce that Dialog Design and Mountain Equipment Co-op (MEC) have won the 2018 Salmon-Safe BC Design Competition for Urban Development. Each of the two winners will receive $6,000 towards the cost of a Salmon-Safe assessment and certification, which includes technical support to implement low-impact development solutions and Salmon-Safe urban standards on their site to address land and water impacts. Criteria for the competition are below. The core challenge was this: How can we reimagine our cities and design our urban buildings to adapt to climate change and address water quality, water quantity, and the restoration of aquatic and terrestrial habitat? Congratulations to Dialog Design and Mountain Equipment Co-op (MEC) for their winning submissions and to North Shore Rain Garden Project, which received an honourable mention. Read on to see how innovative approaches can change our concept of urban development. This office building will feature a number of stormwater treatment, water storage and water reuse elements including a green roof, large stormwater channel and rain garden which will maximize water infiltration. An underground detention chamber will also be installed in the parking lot which will harvest water for other uses such as irrigation or toilet flushing. 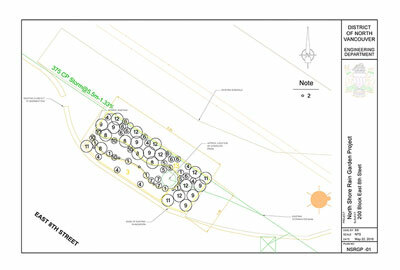 The site will also feature lots of green space and plants for biodiversity, habitat and drought tolerance. 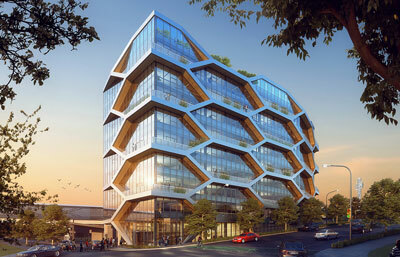 We loved the use of biophilia with the adoption of a honeycomb shape for the building. This site will be a new retail location for MEC and will feature a number of stormwater treatment, water storage and water reuse elements. These include a green roof and blue roof to collect rainwater as well as an underground rainwater harvesting system for non-potable water uses such as toilet flushing. This is the second MEC site to undergo a Salmon-Safe assessment process, which demonstrates MEC's broader commitment to the environment. Not only do they encourage their customers to care for the outdoors but they bring this ethos to the construction of their buildings. We are excited to work with MEC again! Partnering with QuadReal Property Group on their Capilano Mall site, the North Shore Rain Garden Project proposes to construct a rain garden demonstration project in the current parking lot adjacent to Mackay Creek, which is a salmon-bearing stream. We are pleased to see this proposed approach to bettering water quality for salmon. The competition is now closed and this section is for information only. Learn more about how to make your own urban site Salmon-Safe by contacting us. Stormwater run-off is one of the largest non-point sources of pollution in urban areas affecting the health of salmon and our watersheds. Stormwater often contains contaminants such as hydrocarbons and heavy metals derived from vehicle exhaust, brakes and leaked fluids as well as nutrients, pesticides and bacteria from urban and agricultural uses. During rainy days, these contaminants are collected by rainwater, flow over large paved, impervious surfaces and drain into local fresh and marine waterbodies through storm drains and pipes. The Salmon-Safe BC Design Competition for Urban Development challenges you to answer: How can we reimagine our cities and design our urban buildings to adapt to climate change and address water quality, water quantity, and the restoration of aquatic and terrestrial habitat? The competition is intended to encourage visionary, progressive and innovative development champions and other landowners to bring design solutions for responsible land and water management to life. The winners receive $6,000 each towards the cost of a Salmon-Safe assessment and certification, which includes technical support to implement low-impact development solutions and Salmon-Safe urban standards on their site to address land and water impacts. For details, see the competition details and guidelines.